Don’t miss this opportunity to come and see Dr Marilyn Glenville PhD, the UK’s leading nutritionist specialising in women’s health. Come to this talk to find out why diets don’t work and what does. Do calories count and are all calories equal? Paleo versus keto versus intermittent fasting – do they work? How effective are vegan and vegetarian diets for weight loss and how to keep yourself healthy on them. Does the timing of your food make a difference? Think of a number diet 5:2, 16:8, 12:12 - this talk will sort out the confusion. And show you how to eat if your weight is piling on around your middle which can increase your risk of breast cancer, type 2 diabetes, heart disease and Alzheimer’s. So isn't this just another diet book? What's new about this one? Lots. For a start this book is not about your blood group, your body type, your Zodiac sign, or the initial letter of your first name! There are no gimmicks in this book which is why the information works. You will lose weight and this time you will keep it off. 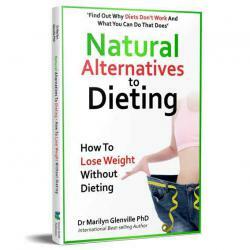 What all dieters want and need is a way of eating that is a way of life. And preferably an enjoyable way of life. This book will take you to that new life. It's all about a way of eating that allows you to have a life! To eat comfortably at home with family and friends but also to be able to eat out in restaurants. On this ‘diet’ you can have a normal social life! If you know you are among the millions who live to eat, then prepare yourself for a major life change. You've bought this book, you obviously want to escape the treadmill of never-ending dieting but of course you still want to lose weight, in fact you want to lose fat. With this way of eating you will. Get ready to turn your life around and start eating to live rather than living to eat. You'll be amazed at the difference. company offering a range of carefully selected, completely natural products to support healthy living. Recommended and approved by Dr Marilyn Glenville – the UK’s leading nutritionist to combine health and wellbeing in their lives by providing easy access to products which compliment a natural and healthy lifestyle. WHAT’S SPECIAL ABOUT NHP PRODUCTS? Dr Marilyn Glenville PhD is a registered member of the Nutrition Society, a Fellow of The Royal Society of Medicine, psychologist, author and broadcaster who obtained her doctorate from Cambridge University. Dr Glenville has studied and practised nutrition for over 25 years, both in the UK and in the USA, focusing on the natural approach to female hormone problems. Today she is recognised as the UK’s leading nutritionist specialising in women’s health. She is the President of the Food and Health Forum at the Royal Society of Medicine and is a patron of the Daisy Network, a charity for premature menopause. Dr Glenville was also formerly an observer on the Food Standards Agency’s Expert Group on the safety of vitamins and minerals. Dr Glenville has had many papers published in scientific journals, frequently advises health professionals and has lectured at academic conferences held at The Medical Society, The Royal College of Physicians and The Royal College of Surgeons. Dr Glenville was invited to give a presentation in the House of Lords to The Scientific and Technology committee, on behalf of The nutrition Council (NTC), on the standards of nutritional training in the UK and the benefits of nutrition to the general public. In 2005, Dr Glenville was also invited to give a presentation at The Royal Society of Medicine as part of the celebrations to mark the RSM’s bicentennial year in conjunction with the Prince of Wales’ Foundation for Integrated Health. With her special interest in the female hormone cycle, Dr Glenville frequently works with women who suffer menstrual problems such as heavy periods, painful periods, PMS, fibroids, PCOS and endometriosis, and who wish to work on a nutritional approach to these problems. Dr Glenville also helps couples who are having difficulty conceiving or having recurrent miscarriages. Dr Glenville also lectures regularly for all the major nutrition schools in the UK at graduate and post graduate level. Dr Glenville is a popular international speaker. As a respected author on women's healthcare she gives regular talks on radio and has often appeared on television and in the press. She is the author of 9 internationally bestselling books (see below) many of which have become the standard reference books for practitioners and have sold over 500,000 copies worldwide.